How does the Smoothcam filter in Final Cut Pro work? 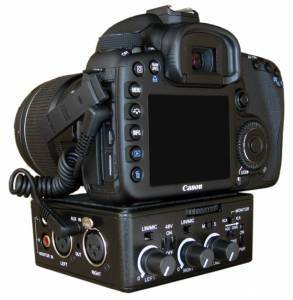 Beachtek’s DXA-SLR is a portable, compact, dockable, dual-channel mixer designed specifically for outputting to DSLR cameras or to any camcorder or other recording device with an 1/8” mini-plug audio input jack. It’s flat black, made of sturdy die-cast aluminum and weighs only 12 oz. without a battery. It’s squarish in shape and very compact, measuring just 4.25” x 4” x 1.75”. It includes a dual-channel 48v power supply and is powered by a single 9-volt alkaline or lithium battery. According to Beachtek, you should get three hours of operation with an alkaline battery and five hours with a lithium one. There is also a dual-position switch on the DXA’s underside for selecting the correct ground configuration with any DSLR camera. The DXA-SLR features both line and mic level inputs. The dual XLR mic inputs are rated at 6 dBu in lo-gain mode and -12 dBu in hi-gain modes. Its wide bandwidth pre-amps are designed for exceptionally low noise. It features LED signal level indicators for each channel. However, they only light up in response to strong signals of a certain intensity. Green appears to indicate signal strength of at least -12 dB, while it glows red for overmodulated audio, i.e. above 15 dB. There is no LED display for signals below -12dB. The DXA SLR also lets you disable the automatic gain function, to avoid the wild and sudden swings in audio level that can occur with it. This option also reduces noise during relatively quiet intervals while recording. via In Review: Beachtek DXA-SLR Adapter.